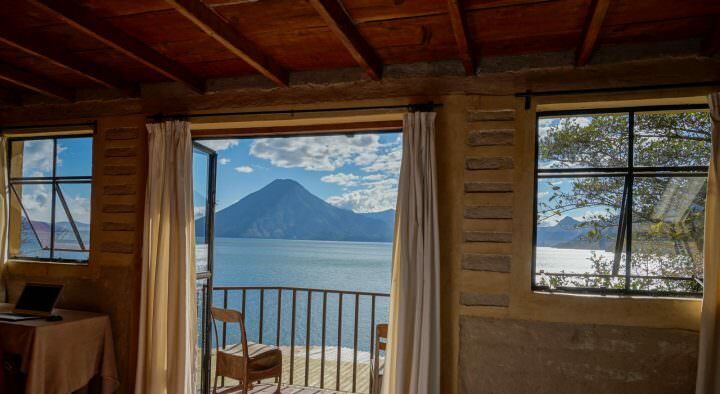 As a person who earns an income entirely online, I know how overwhelming it can be to find the right kind of remote work. If you love teaching — math, chemistry, history, physics, etc. — and are looking for a cool online job that allows you to interact with people and help them improve their skills, then online tutoring jobs could be perfect for you. But, online tutoring isn’t just available for specific subjects. You can help students study and prepare for tests as well. 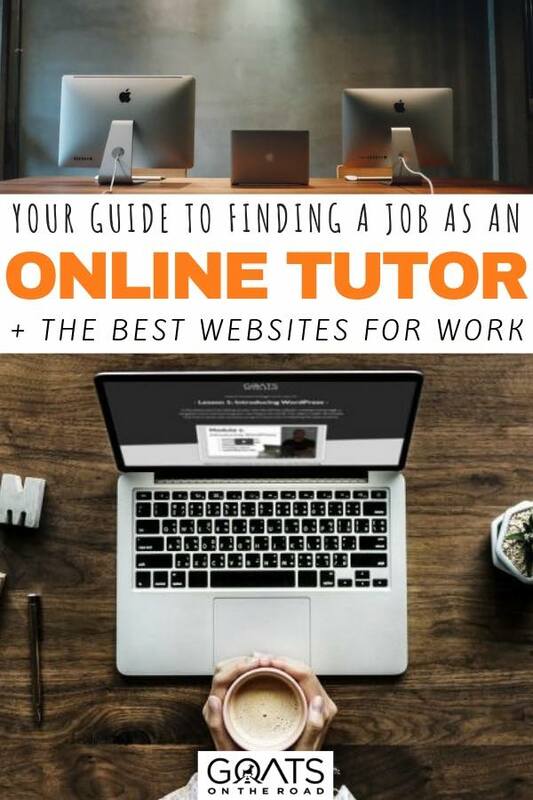 Finding jobs tutoring online has never been so easy thanks to a plethora of websites, networks and job boards available all over the web. 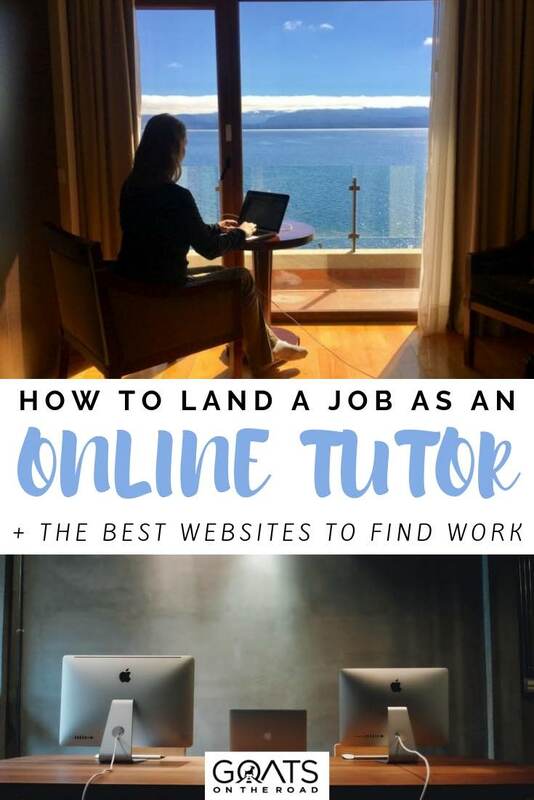 In this article I’m going to not only list the best websites for online tutoring jobs, but I’ll also cover some tips on creating your resume, applying for and actually landing that perfect online tutoring job. Why Work Online In The First Place? Working online gives you the freedom to work whatever hours you want. You can skip the wasted time stuck in traffic as you wouldn’t be commuting to and from an office job. 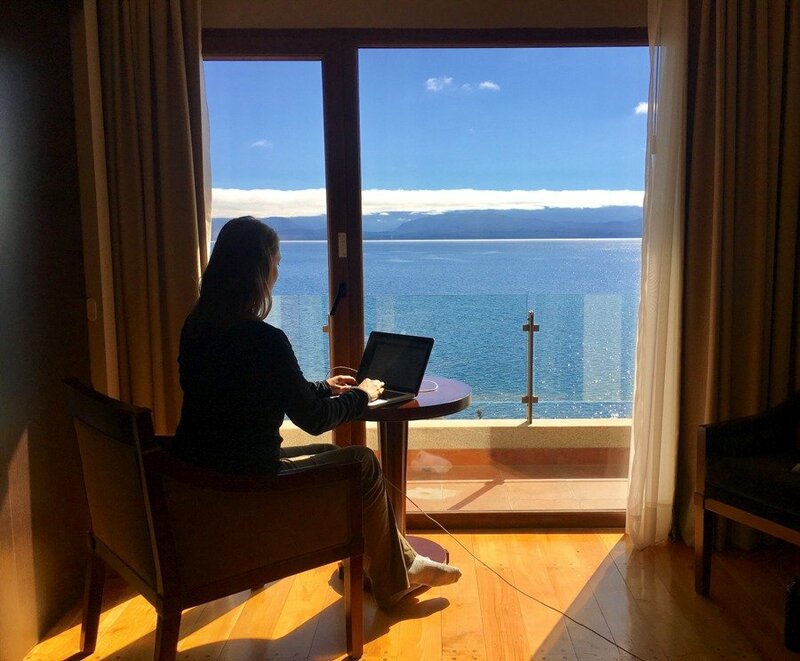 You can work from literally anywhere in the world as long as you have a solid wi-fi connection and you can even work in your pyjamas if you want to. Ever since Dariece and I quit our 9-5 jobs in Canada, our lives have totally transformed. I’m writing this very post from a patio overlooking a pool and the stunning sea here in the Caribbean. 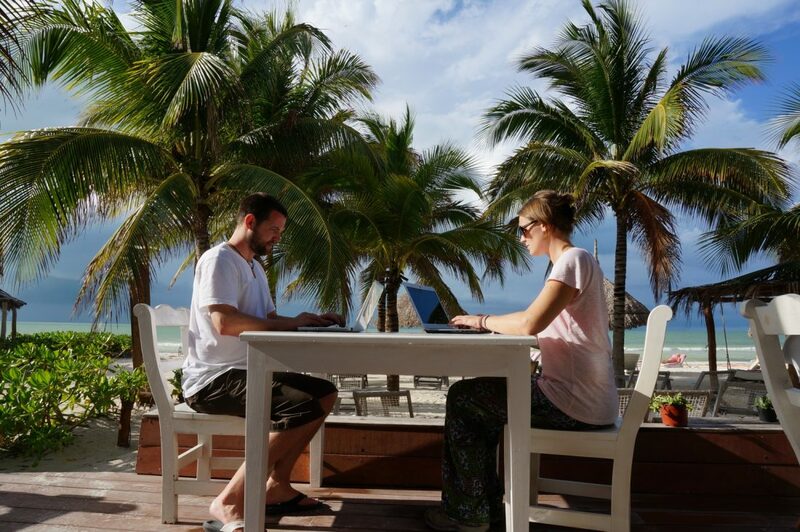 Remote working and online jobs have given us the freedom to work when we want, how we want from wherever we want. If you’re looking for a change from the grind of normal life, then online tutoring jobs may be the perfect place to start. 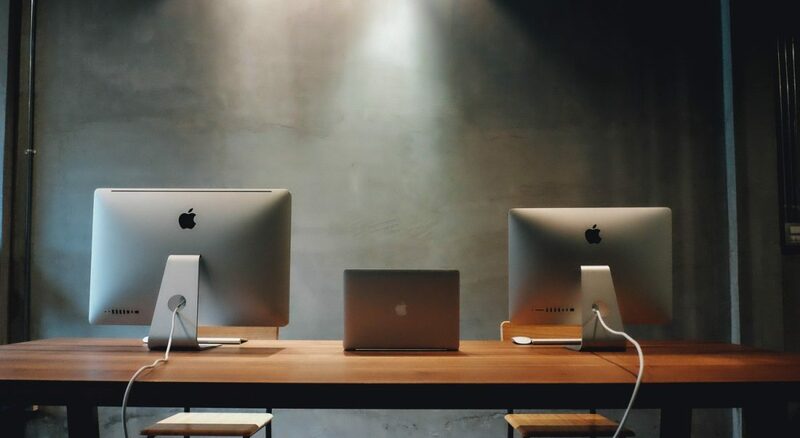 You can begin by simply doing some online tutoring on the side as part-time work, and as your clientele starts to grow, you may be able to quit your job and go full-time with online work. Once you’re fully working for yourself online, the freedom that you’ll have to live, travel and spend time with loved-ones is priceless. 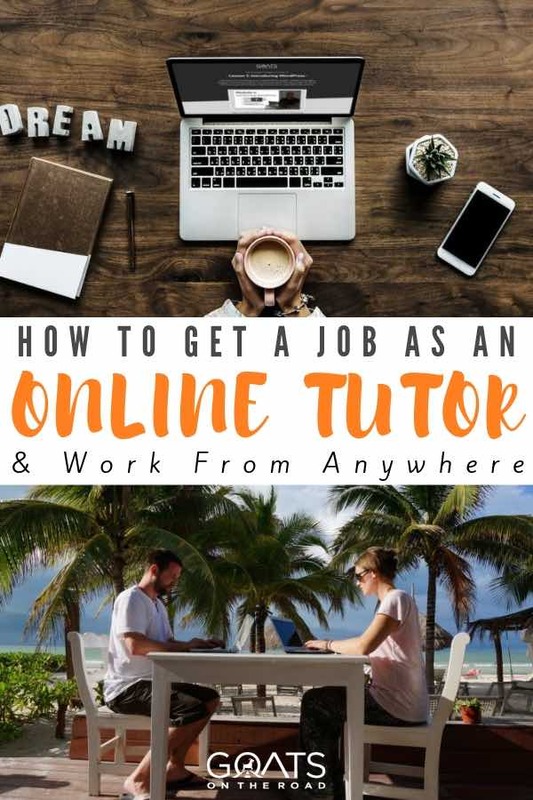 While there are a lot of people who are realizing just how awesome it would be to get an online tutoring job, many of them simply aren’t finding work, or aren’t able to fully support their lifestyle through online tutoring jobs. Here are a few tips to help you succeed in finding and sustaining online tutoring work. As an online teacher, you’ll be expected to keep the attention of the class (especially with younger students). This means that you’ll have to be upbeat, positive, encouraging and energetic every single time you open your computer and start teaching a class. In order to help your chances of getting the perfect online tutoring jobs, make sure you’re just as energetic in your interview. With many of the online tutoring job websites that I’m going to list in this post, you’ll have to complete a Skype interview before you get hired. During this interview, make sure you prove that you’ll be able to captivate your audience during your teaching sessions. This is key. Many people apply for a dozen different online tutoring jobs before they actually land one. In order to better your chances of success, try to apply for as many different jobs as you can in as many different fields as you’re able to teach in. Even though teaching online means that you can pick your own hours, it’s best to have an open schedule when working with these companies. The more hours you add into your schedule, the more work you’ll get. Don’t be afraid to get up a little earlier, or stay up a little later, in order to teach students in different time zones. It’s important that you read the application guidelines for every single job posting before you apply. As an online teacher, you’ll be expected to follow a curriculum, so if you can’t even follow simple application requirements, you won’t likely get the job. Know the job you’re applying for, have the correct documentation and be ready for the interview. There are literally thousands of different types of online tutoring jobs online, so no matter what you should be able to find work teaching others a skill that you already know. I couldn’t possibly cover all of the different types of tutoring jobs available, so I’ll just cover some of the most popular ones. These jobs have the most opportunity because there are so many different websites and job boards with these types of postings. If you’re already a teacher, whether for elementary, high school or university students, you will have an easier time finding well paid online tutoring jobs thanks to your experience and resume. Make sure you add that you’re a teacher by profession when you apply for the jobs and when you create your profile on online tutoring job websites. VIPKid is probably the most reputable and trusted company for teaching english online. They pay extremely well, have a great curriculum structure and class software and they truly value both the teachers and the students on the platform. Unfortunately at the time of writing, VIPKID only accepts teachers from USA and Canada, but hopefully this will change in the future. For now, if you’re Canadian or American, then there’s no better company to go with. Qkids is another very reputable online English tutoring website. They don’t pay quite as well as VIPKID and one of the main disadvantages is that you actually have to reside in Canada or the US in order to teach with Qkids. This takes away the location independence that you can enjoy with many of these other companies, but it still offers a great curriculum, good pay and a quality online tutoring platform. Education First is a great online teaching platform because they have a wonderful classroom software and they also accept teachers from the UK. If you are from the UK and you’ve been searching the web for online English tutoring jobs, you may have noticed that many of the best programs have a preference for US and Canadian teachers. Not EF Education First! If you’re from the UK, this is the company for you. This company is just a year old, but is already making a name for itself. The requirements for this job are that you’re from the USA or Canada, are native English-speaking, and hold a Bachelor’s Degree. They also offer opportunities for you to get secondary positions as an interviewer, trainer, social media admin, proofreader and more. If you’re a math teacher searching for online tutoring jobs then you have a lot of options. All of the jobs listed above also accept math teachers, but they focus on teaching the English language. These jobs below offer opportunities specifically for math tutors. Math Elf is all about tutoring math. They don’t offer any other tutoring opportunities for other subjects. This one is pretty cool because all you have to do is download the app onto your iPad, apply, and you could be tutoring today. While Math Elf does claim to have some tutors on their app earning upwards of $2,200 / month, most tutors average around $300 – $350 per month. Tutor.com actually has all sorts of online tutoring jobs available, but they have a specific section for math with hundreds of tutors. Because many of the tutors in the math section have thousands of reviews, it may take you some time to build up a solid clientele, but with hundreds of thousands of students on the website, you’ll have no problem finding work once you’ve made a name for yourself. Yup is a popular online tutor website for Americans who are looking to teach math (or chemistry and physics) and tutor students in the K-12 system between kindergarten to grade 12. Pay is based on your previous experience, the amount of hours you work, the openness of your schedule and a few other factors. Most applicants are either accepted or denied within 24 hours and once you’ve been hired, you’ll be given a weekly teaching schedule and curriculum that is easy to follow. Bonus: FlexJobs has all sorts of remote jobs available including many online tutoring jobs. They have an annual fee to sign-up, but they have one of the most extensive lists of remote jobs anywhere online. If you’re really looking to work from home, or while you’re travelling, Click Here to check them out. Tutors are always needed to help high school students pass their classes and exams. Here are some of the best online tutoring jobs to do just that. Skooli has fewer restrictions on tutors than many of the other websites listed in this post. You can be from pretty much anywhere (though job listings do vary by regional demand) and you can tutor elementary students all the way up to college. Aim4A is another very powerful online teaching platform that pays quite well. You’ll need to have a university degree to apply, but the subjects covered range from math, science, social studies, history and more. Brainfuse has a lot of different teaching opportunities for pretty much every subject under the sun. You will need to have at least a 4 year university degree in any subject and preference will be given to applicants who have previous teaching experience. TutorVista currently has a very wide range of tutors from India, United States, UK, China, Southeast Asia, Australia and Canada. 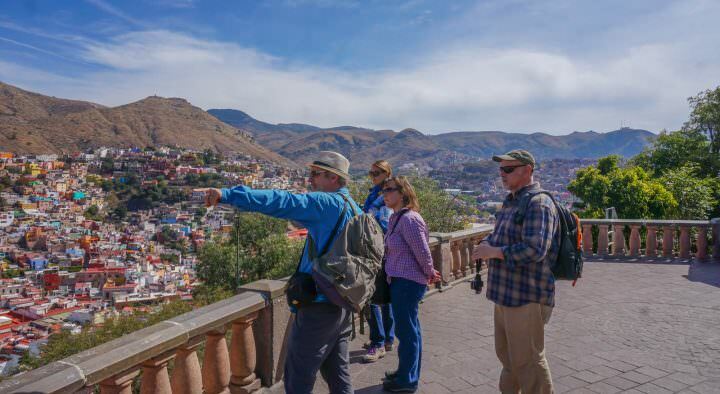 They have personalized teaching methods for each subject to ensure that tutors can properly help their students master basic to advanced level concepts and eventually meet their short and long-term academic goals. Instructional Connections has a lot of different programs available. Instead of becoming an online tutor like most of the other websites listed in this post aim to help you do, you’ll instead be a coach or teacher assistant for a given subject. The website is unclear about compensation because there are so many different subjects available. The best way is to apply and you’ll be given a salary rundown based on what jobs you qualify for. With its main headquarters in Baltimore, MD, Connections Academy has online teaching programs for all sorts of different subjects, mainly focusing on K-12 students. They offer free, public online eduction as well as paid tutoring for students across the US. K-12 is an online tutoring platform for all students between kindergarten and grade 12. There are lots of opportunities on the site for teachers living in the USA. One of the main benefits of tutoring on K12 is that you get full benefits with their program including medical, dental, vision and 401k. Teens will definitely have fewer opportunities for online tutoring jobs mainly because many of these companies require previous experience and in many cases, a university degree. Here are a few options for online tutoring jobs for teens. The best way to get online tutoring jobs if you’re a teenager is to utilize websites like Skillshare, Teachable, Upwork & Fiverr (more on those below). For many people, a more lucrative approach may be to start an online tutoring business, rather than giving up money off of your salary or monthly wage to a third-party company. Creating your own online tutoring business isn’t very difficult these days, thanks to a couple of great online resources. One way you can host your own online tutoring sessions and courses would be to create a website with WordPress. 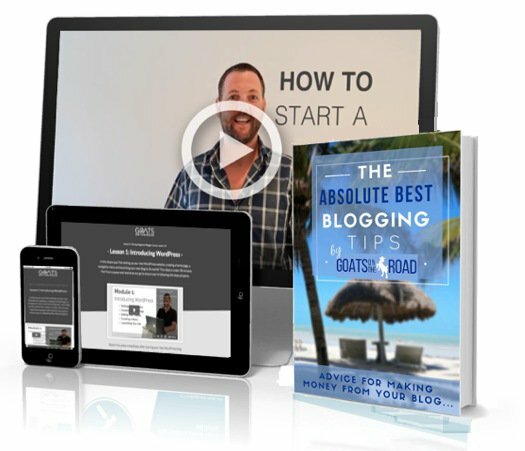 First you would have to start a blog and buy a domain which costs as little as $56 / year, and then you could add your services with prices to the website. I have a courses / online learning section on this website and it only took me a few weeks to set up. Upwork is an online platform where anyone can post up their freelance services. This means that it’s great even for teenagers as they can post up jobs for exam help, language tutoring, math tutoring and pretty much anything else. Fiverr is another popular platform for people to put all sorts of services up for others to purchase. Traditionally each service or product on Fiverr was just $5 (hence the name), but these days there are many different packages available on the website, many of which cost more than $50. You could put together a “tutor pack” for your specific skill and sell it on Fiverr. 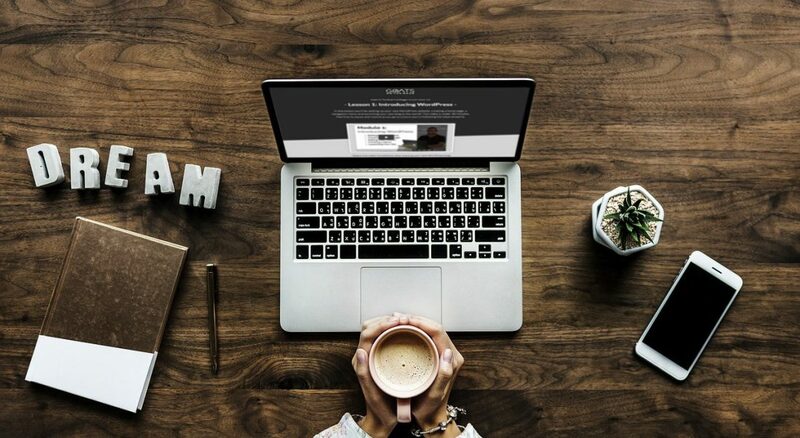 Teachable is an online learning platform where you can create multimedia courses and sell them, either to your own audience, or to the massive marketplace already available on the website. In reality, Teachable only gives the top 5% of creators access to their own promotions and following, but it’s still a very easy place to create tutoring material and sell it. Skillshare is another online learning community with thousands of classes in design, business, tech, and more. Anyone can join the millions of members in their community to tutor cutting-edge skills, network with peers and discover new opportunities. There are over 5 million paid teachers on the platform, so there’s definitely a place for every type of tutoring on Skillshare. In order to get more traffic to the site or to your courses on third-party platforms, you could practice SEO and try to get people to organically come from Google and other search engines. 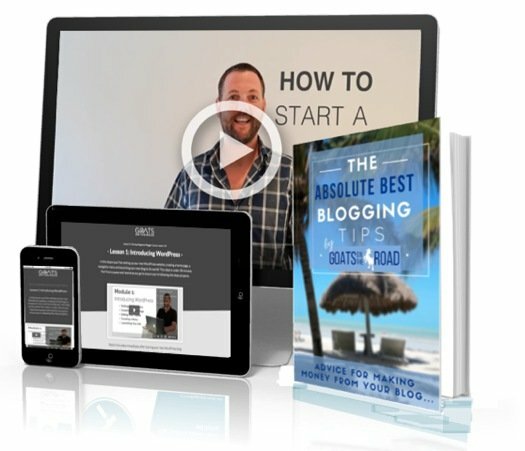 We have a free 1-hour SEO training video session to help you quickly learn SEO to drive more traffic to your site. Alternatively, you could pay for Facebook ads to drive traffic to the page on your site which lists your services. Once you have students, you could also use plugins like MemberMouse to hide certain content and only make it visible for paid clients. That way you could have pre-recorded lesson plans, downloads and curriculum that people could access after paying. We’ve done this with this blog and it’s been amazing. I’ve listed many different websites for online tutoring jobs already in this post, but these are mostly specialty subject websites or course selling platforms. There are also quite a few websites that allow tutoring of all kinds. Whether it’s for woodworking, art, chemistry or science, you’ll be able to find jobs tutoring on these websites. I’ve listed Tutor.com already in this post, but it’s a great place to find work for all sorts of tutors. Currently Tutor.com is hiring teachers, professors, adjuncts, PhD students, and industry professionals, who are all passionate about their areas of expertise and eager to help students learn algebra, calculus, statistics, English, chemistry, physics, test prep, SAT prep and more. TutorMe is another massive company which covers over 300 subjects across all grade levels. If you haven’t found a tutoring position for the subject you’re an expert in on any of the other websites in this post, then you’ll likely find it on TutorMe. They have a great teacher-student interface for classrooms and they even allow you to join a demo lesson from their home page. Pay for tutors on TutorMe.com maxes out at around $18 per hour. One of the great things about Chegg is that it’s open to tutors from all over the world and they have all sorts of subjects available. In order to apply you’ll need to have proof of enrollment in a university and you’ll need to have a Facebook account. 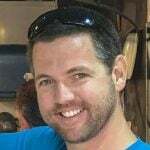 Tutors on this site will earn $20+ per hour and will be paired with students looking for tutoring in their chosen subject. Revolution Prep is more for American tutors who have a bachelor’s degree looking for full-time work (often on weekends as well). The pay is good at around $25 – $30 per hour and you’ll be eligible for some valuable health benefits like 401(k), health insurance, and paid holidays. Whether you choose to go through a major online tutoring website like Tutor.com or TutorMe.com, or you start your own online tutoring business and attract your own clientele, there’s no doubt that tutoring students online is a great way to make money. There will always be students looking to learn new skills, pass their next exam or just reach their academic goals and becoming a tutor to help them get there is rewarding, fun and exciting. For more on tutoring English, definitely check out Qkids, Education First and VIPKID and if you’re into creating online training material, Teachable.com is likely the easiest and most affordable way to go. That is awesome, I wanted to try tutoring before but I do not know where to find them, thanks for the suggestions!